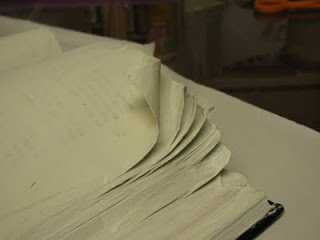 Today I started on my altered book project. It is my first attempt. It will be more of a wall decoration when I am done. At least, that is my plan. I saw in a magazine a wall display with all white objects and one looked like an open book that was all white. I decided to combine that idea with the altered book idea. I found an old book being given away at a local library and it had words I could pick out that related to a trip to North Carolina we took this summer so I gessoed around those words and will include them when I hand write some journaling in. Then I plan to add a couple of pics from our trip. I have gessoed everything and now have to decide if I want to paint it white or make a more colorful background. I don't want my pictures to get lost in a busy background. Maybe a golden color, don't know yet. Hi Susie. I recognize that inner struggle to call yourself an "artist" and to share with people what you have created for fear it is not good enough. I go through that a lot of the time too. I think most artists do. I do want to say that I LOVE your laptop bag and also can't wait to see what you do with your altered book project. I have not done anything like this ever. Looks like fun. You have a varied creative talent and that is wonderful! Thanks for commenting on my blog too! Many "wonderful days" in store for us, I am sure. I look forward to watching this project unfold. Buckets of love and admiration! 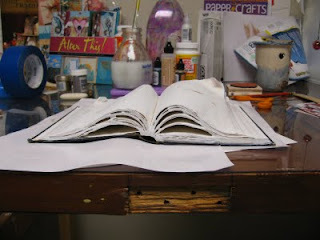 I love the idea of an altered book project although I haven't tried one. I'll look forward to seeing this project unfold! This is such a great project. WOW. I am excited to see what you do with the book. Can't wait to see what you do with this book. I have a book to alter, but am hesitant to start. I LOVE the laptop bag you made - gorgeous!! 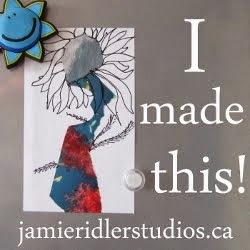 i am in awe of altered book artists...like to see yours at the beginning...keep going!! I love the idea of taking away the words that don't fit and leaving the ones you want - almost like "word sculpting". I look forward to seeing the next steps in this project. I really like this! I've wanted to make one myself, but never have attempted it. I hope you'll continue to show it to us throughout the process. Thanks for visiting my blog today. The quilt was therapy for me. I'm much better now. Thank you. 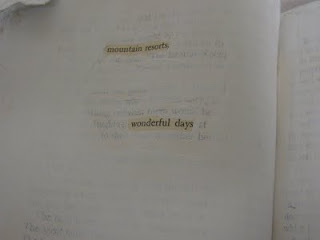 Susie, I did an altered book with a couple of friends. Once we got beyond the idea of destroying a book, it was a blast. I look forward to seeing it progress. 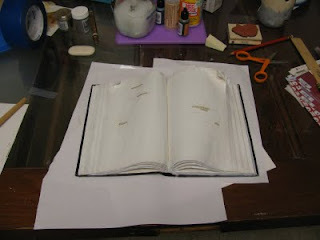 Ooo, altered book so intriguing! I've always wanted to try, but can't think of what book I would dare dig into!